AMSOIL Power Foam® (APF) is formulated with powerful foaming agents that effectively remove stubborn carbon deposits, varnish and gum in combustion intake systems. 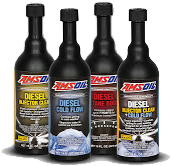 Especially effective in powersports, small-engine and carbureted-vehicle applications, it helps restore startability and engine smoothness, while maximizing fuel economy and horsepower for improved overall engine performance. Because Power Foam is too aggressive for degreasing certain surfaces, new AMSOIL Heavy-Duty Degreaser (ADG) is recommended for degreasing. Heavy-Duty Degreaser joins the lineup. New AMSOIL Heavy-Duty Degreaser (ADG) is formulated with powerful and fast-acting solvents, attacking petroleum-based grime on a molecular level to loosen its hold on metal, concrete, engines and other surfaces. Its active d’limonene (citrus) formula makes cleaning easy and leaves a clean scent.